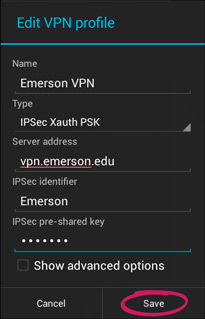 Emerson's VPN, or Virtual Private Network, provides secure off-campus access to IP restricted services such as Banner. The VPN is only available for Staff and Faculty (not students) and we prohibit remote desktop log in to campus workstations, such as your desk computer. Accessing the VPN requires two factor authentication (2FA) to login. Unlike Gmail, Box, or SSB Banner, the VPN will not provide a visual prompt or web browser for users to choose their authentication method of choice, but will simply send a Duo Push to your phone when you connect. 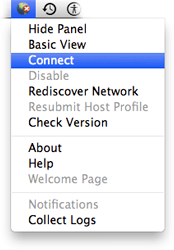 Mac OS X requires a third-party utility to connect to the Emerson VPN. Begin by going to https://vpn.emerson.edu and logging in with your Emerson username and password. Click the Download Mac 32/64 bit GlobalProtect agent link. Open the installer package and follow the prompts to install GlobalProtect. Now that you've configured GlobalProtect, any time you need to connect to the Emerson VPN, simply choose Connect from the GlobalProtect menu. At this point, users will be prompted to verify their authentication via two factor. Please check your setup device for a push notification or phone call. The globe in the menu bar will display a shield while you are successfully connected. When you are done using the VPN, select Disconnect from this menu. Windows requires a third-party utility to connect to the Emerson VPN. Begin by going to https://vpn.emerson.edu and logging in with your Emerson username and password. Click the link to download the Windows GlobalProtect agent for your system type (32- or 64-bit). Open the installer package and follow the prompts to install GlobalProtect. Once GlobalProtect is installed, a globe icon will appear in your system tray. Click this icon. Now that you've configured GlobalProtect, any time you need to connect to the Emerson VPN, right-click on the GlobalProtect icon in the system tray and choose Connect from the context menu. The globe will display a shield while you are successfully connected. 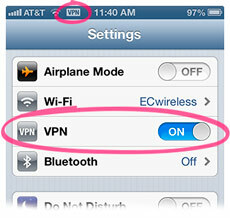 Now that your device is configured, a VPN switch will appear on the main Settings screen. To connect, toggle this switch to ON. Once you are connected, a VPN icon will appear in the status bar. All of your network traffic will go through the Emerson VPN while you are connected. Once you no longer require the VPN, disconnect from it using this same switch. Open Settings and select More... under Wireless & Networks. Select VPN. 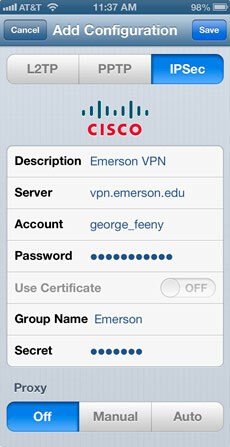 In Settings, under Wireless & Networks, select More... > VPN > Emerson VPN. Check the box next to Save account information. Any subsequent times you want to connect to the VPN, open Settings. 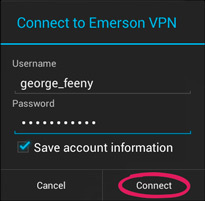 UnderWireless & Networks, select More... > VPN > Emerson VPN and your device will connect. 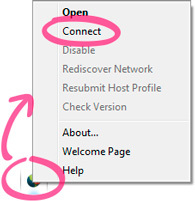 Once you no longer require the VPN, disconnect from it by selecting VPN Activatedfrom the device's pull-down menu, then selecting Disconnect. You can also disconnect by navigating to Settings > Wireless & Networks > More... > VPN >Emerson VPN, then selecting Disconnect.